Hi there everyone! Today I'm super excited to be joining Pinkfresh Studio for their October release Blog Hop! And to celebrate we have giveaways, gifts and promo-codes, so make sure to read until the end for more information! ¡Hola a todos! ¡Hoy estoy encantada de acompañar a Pinkfresh Studio en el lanzamiento de su colección de octubre! Y para celebrarlo tenemos sorteos, regalos y códigos promocionales, así que leed bien hasta el final para saber más :). For my first card I have used the beautiful "Lush Greenery" stamp set and its coordinating dies. Para mi primera tarjeta he usado el set de sellos "Lush Greenery" y los troqueles coordinados. I colored the leaves with Copic Markers from the B and BG family and then created a background with Distress Oxide inks. A bit of foam behind the leaves gives the card a nice dimension. He coloreado las hojas con rotuladores Copic de la familia B y BG y después he creado un fondo con tintas Distress Oxide. Un poco de espuma de doble cara detrás de las hojas le da un punto de dimensión a la tarjeta. For my second card I've used the dies "Dainty Blossoms" and "Noteworthy frames". I created a background with Distress Oxide inks (Blueprint Sketch, Peacock feathers and Tumbled Glass), heat embossed the sentiment and die cut the frame in the middle. Para mi segunda tarjeta he usado los troqueles "Dainty Blossoms" y "Noteworthy frames". He creado un fondo de tarjeta con tintas Distress Oxide (Blueprint Sketch, Peacock feathers y Tumbled Glass), embosado el sentimiento y troquelado uno de los marcos en el medio. Lastly I die but the flowers, put them inside the die cut lines and also added a white frame around the whole panel. To finish up the card I used a few droplets. Por último, he troquelado las flores, las he puesto dentro de la parte troquelada y también he añadido un marco blanco alrededor de todo el panel. Para acabar la tarjeta he pegado unas cuantas gotas de silicona. Pinkfresh Studios is giving away the ENTIRE new collection to one lucky winner drawn from the comments on their blog. 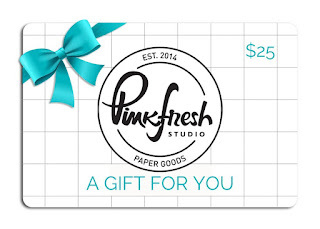 Also if you leave a comment on this blog you could win a $25 gift certificate to the Pinkfresh Studio shop. (Winners will be posted on Sunday October 14th here. Make sure to check it out, you need to claim your price!). But that's not all you guys! 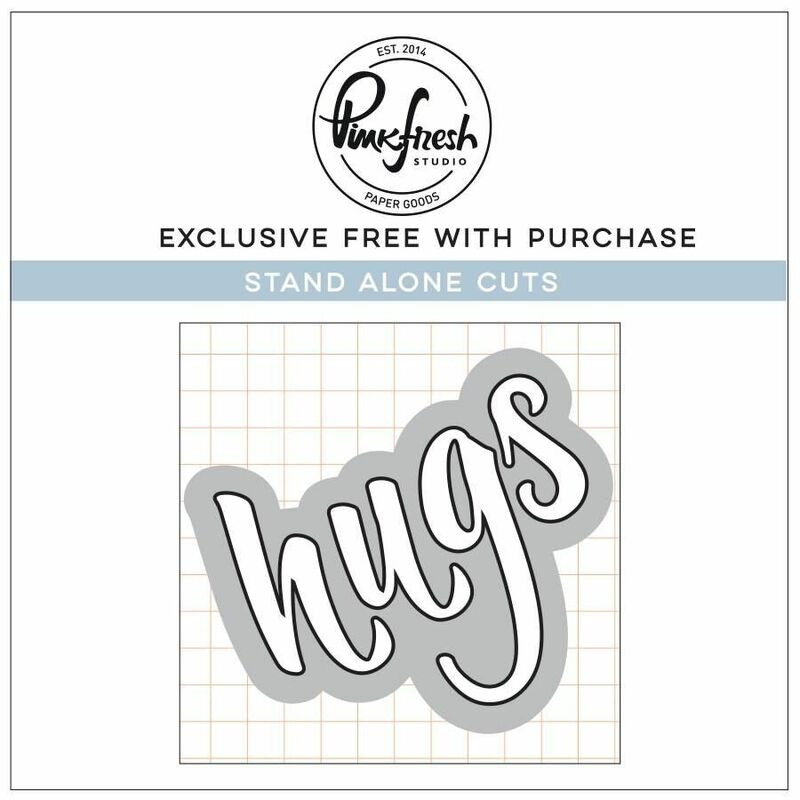 There is also a free HUGS die with every order (it must include something from the new release) and free/disccounted shipping in orders over $50 from October 8th till 11th. Use the code OCTFREESHIPWITH50. ¡Pero eso no es todo! Además regalan un troquel ("hugs") con cada compra que incluya algo de la nueva colección y envío gratuito/con descuento en compras superiores a 50$. Usad el código OCTFREESHIPWITH50. And here is the blog hop list! Enjoy! Y aquí tenéis la lista de blogs que participan. ¡Que lo disfrutéis! Adore the beautiful simple design for such a beautiful message. Great cards and love this new release. I think I like Happy Hugs the best so far. Thanks for sharing. Love the cards Love this release! Both cards are gorgeous! I love the color scheme you used. Love your cards! :) Awesome color choices. Gorgeous cards, I love the color combinations. Simply beautiful. Great cards, love your house and greens in the first card. Good work! The new release is fabulous. And I love the gorgeous inspiration cards. The first one is my favourite. The Lush Greenery set caught my eye immediately and I am happy to see it in action! Love the unusual colours you have chosen. Oooh, LOVE this color combo. So pretty!! These are beautiful, I love the turquoise and blue color combination. As others have said, the color combo is beautiful! Love both of your cards; they are just stunning. I love all of the colors you used. This die is one of my favorites. It is just a beautiful card!! Great work. In the words of my 11 yr old daughter, this was another awesomesauce release! Love it all and that card is so sweet! Beautiful simplicity. Love the blue/green colour combinations. Lush Greenery is one of my favorites in this release. 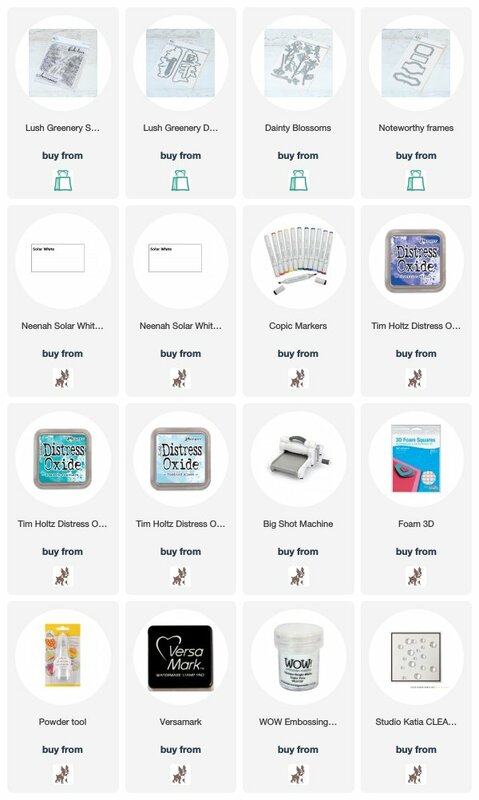 Those beautiful blues are so awesome on your card. Just perfection! Such lovely cards. I love the colors you have chosen--so serene. These two cards are just beautiful. I love the turquoise and blue together. And that sentiment set is so encouraging and lovely! Beautiful cards, especially the Dainty Blossoms card! Stunning! The white flowers really stand out beautifully against the blended background. Thanks so much, and have a blessed day. Hugs!!! Beautiful release! Love the dies, especially the noteworthy frames -- so clever. I ordered the Greenery stamp set. I love it in the colors you used. Such beautiful cards! Love the shades of blues you used on your cards! Lush greenery stamp set is so beautiful! Stunning cards, absolutely beautiful colors! loved the way you used the products. such pretty cards! Beautiful cards! Those leaves and the dies are gorgeous! You've used the same color palette on both cards, and I like it. The foliage on both top and bottom is unique. Your cards are goregous! The images and dies are lovely and I love the blue/green colors. Gorgeous mix of colors on these beautiful new stamp sets. Beautiful cards. I really like the dainty blossoms die set. It and The noteworthy frames are on my wish list. Beautiful cards! Adding these stamps & dies to my wish list. Love the card. The colors and the simplicity is great. Your non-traditional color scheme for the Lush Greenery card is striking! Both cards are lovely. Noteworthy frames is a brilliant idea. Paired up with Delicate Blossoms makes the top of my list of favorites. Both of your cards are wonderful and I'm loving the dainty Blossoms die. Wow! Awesome release and I love your card designs! Lush Greenery is so pretty. Love your design! I LOVE the blues! What beautiful cards! Beautiful cards!! Love the colors you selected for your Copic coloring. Dainty Blossoms is my favorite. Love the colors and the way it "pops out" to look so real. Beautiful! I love the blues and green colours. So very pretty! And thanks for letting us know about the hugs die! I don't have one, and I love that script. These cards are beautiful and made more so by your choice of colors. Love the combination. Love your beautiful inked backgrounds and your choice of colors! That lush greenery set is awesome! Beautiful, vibrant colors and Distress Oxide backgrounds on your lovely cards! Beautiful cards! Your coloring is lovely and the blues and greens are so pretty together. Love how you cut into the second card to place the flowers. I love your color scheme on both cards. Those noteworthy frames are really going to get a lot of use on my cards. Great cards. Love the release. I like the borders as the greens are colored with color besides green. You used two of my favorites from the release! Gorgeous! Beautiful cards; love youf color choices. I can't wait to get the Noteworthy Frames along with several of the other new designs. So pretty--I like the peaceful colors. Oh wow, I love the blues and greens you chose for these cards. I just want to stare at them all day. The delicate white flowers are particularly striking on top of that really colorful background. I'm impressed you got them on without getting some ink on them! (I never wait long enough for my Distress Oxide ink to dry.) Thanks for sharing these gorgeous cards with us! Hi Amanda, thank you so much for sharing your talent. Your cards are just stunning! Love your mix of colors! Beautiful cards! I truly love the colors you chose. Beautiful cards! Gorgeous color palettes and lovely designs. Your color palette for this blog hop is incredible. I had to jot down the three colors you used so I can give them a try myself. Beautiful cards. I love your colors. I love the message! Love the colours that you choose for the leaves. So unique! I love those intricate flower dies. Beautiful card! Really Beautiful cards!! I love this release!!! Love these cards and the blues are gorgeous. So pretty. Beautiful job! I love these a lot!!!! Thank you so much for being part of this blog hop!!!!! I love your beautiful shades of blues on your cards! They areal so rich and serene and look beautiful! A lot of great products in this release. I love the card you made with the Lush Greenery, one of my favorites from this release. TFS! Beautiful CAS cards! Love the blue greens, and especially love how you framed that first card. Love your color scheme, Amanda, and simplistic designs! Clever way to tuck those flowers into the frame. Such a fun release! Such a fabulous release, and your cards are simply gorgeous, Amanda! Beautiful cards. Love the way you've tucked the gorgeous white die cut flowers in the little opening of the card. And this release is wonderful! Such pretty cards! I love the colors you chose! Wow! Beautiful colors and lovely cards! Beautiful blue blending and two ethereal cards! Gorgeous! Gorgeous cards! Your ink blending is superb! Love the colors you chose for this card! So calming! Fabulous cards! Your Lush Greenery card is gorgeous! I would never have thought to use the blues with this stamp set but it works beautifully! Also love the blue color combo with the dainty set also! Great job! Amanda these cards are BEAUTIFUL! I especially love your color palette.... so soft and airy and I especially love your first card with that beautiful soft ink blending in the background. I can’t say enough wonderful things thank you for sharing! I love the colors you used, the cards are gorgeous! Thanks for sharing your talent! The palette used on your cards is so pretty. This set is lovely and you bring it to life. So pretty! Love the colors and the beautiful border stamp! Awesome dies too!